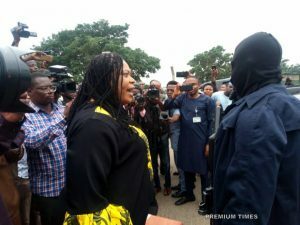 Human rights lawyer, Mike Ozekhome (SAN), said efforts had begun to secure release of former Governor of Ekiti State, Ayodele Fayose, from Economic and Financial Crimes Commission (EFCC) custody. Mr Ozekhome said this in an interview with the News Agency of Nigeria (NAN) in Abuja on Thursday. 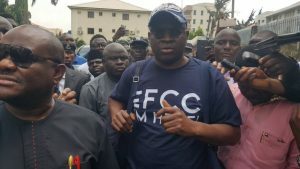 Mr Fayose, whose tenure as governor ended on Monday, had on Tuesday reported at EFCC office in Abuja to answer to some allegations levelled against while in office as governor. Mr Ozekhome said “Fayose’s lawyers are already taking steps to enforce his fundamental human rights by getting him released. Mr Ozekhome said the section of the Administration of Criminal Justice Act (ACJA) permitting a magistrate to detain a suspect for 14 days was illegal. “If they have gotten an order for two weeks from the magistrate court, it is unconstitutional,” Mr Ozekhome stressed. Mr Ozekhome was among Fayose’s supporters who accompanied him to the EFCC on Tuesday. He had said the present administration was governed by constitutionalism, and that it was a constitutional democracy.